You can get rid of weeds with chemical solutions, but for small gardens, spaces around the house, the best solution is natural solutions that don’t ruin or contaminate the air, the soil or the water. 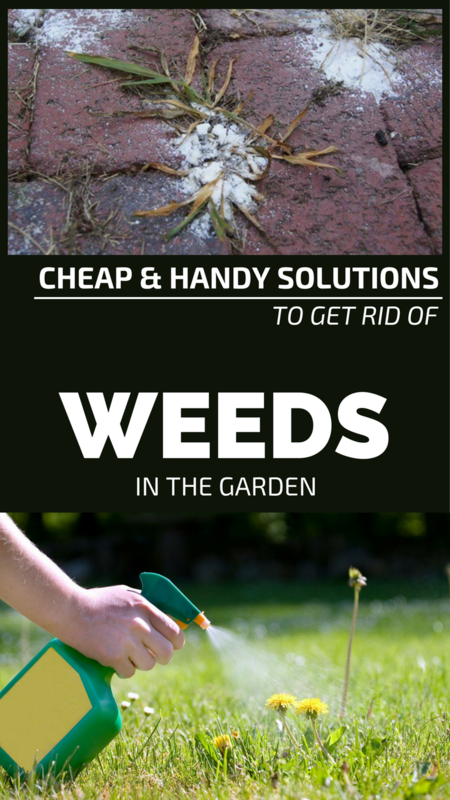 As a result, we have the best solutions and some tips to help you get rid of weeds naturally. First of all, the struggle with weeds is a long-term one, and a victory against them is impossible. But you can diminish them considerably and making them less resistant using these natural solutions. Beside these natural solutions, there are other ways such as removing weeds by hand or constant digging or working the area. It’s one of the natural weapons you have against weeds in the garden. You can dilute vinegar with water in equal parts, but for extreme cases and for quick results, use it as such. Pour the solution in a sprayer and sprinkle over the weeds. You have to do this at midday when the sun burns, but never in the days after the rain. It is ideal for the place you are treating to be dry and not to rain for the next 24 hours. It is another effective and natural solution that gets rid of weeds, but you should keep in mind that a big amount of salt can affect soil’s quality, making it totally inappropriate for other plants to grow. Salt should only be used in places where plants don’t grow (alleys, portions of tiles, ground beneath a terrace or porch, areas around the foundation). To use salt to get rid of weeds, you need a mixture of salt and two parts of water, this concentration being the most effective. Another solution is to sprinkle salt over the weeds. Do this when the sun burns, and watch the weather forecast not to rain in the next 24 hours. In this case you can use diluted vinegar and salt with water in equal. Combine the two solutions and spray over the weeds. It is very important to do it in a dry period at midday because the sun will help this solution to take effect. Baking soda is another good way to get rid of weeds. Prepare a concentrated baking soda mixture with water (2 tablespoons of baking soda in a cup of water). Fill a spray container with this solution and spray over the weeds at midday. Hot water can also be a way to get rid of weeds. All you have to do is put boiled water at the root of the weeds. This method can be used any time of the day.